Contested TexMex?– Give me a Cooked Tortilla! I thought of this topic after despairing of finding a cooked flour tortilla in local restaurants. Undercooked raw-dough flour tortillas are the staple of Houston TexMex restaurants. I don’t think raw wheat flour is part of Tex-Mex cuisine but our restaurateurs obviously do. Certainly no Mexican-American household ever serves raw flour tortillas. 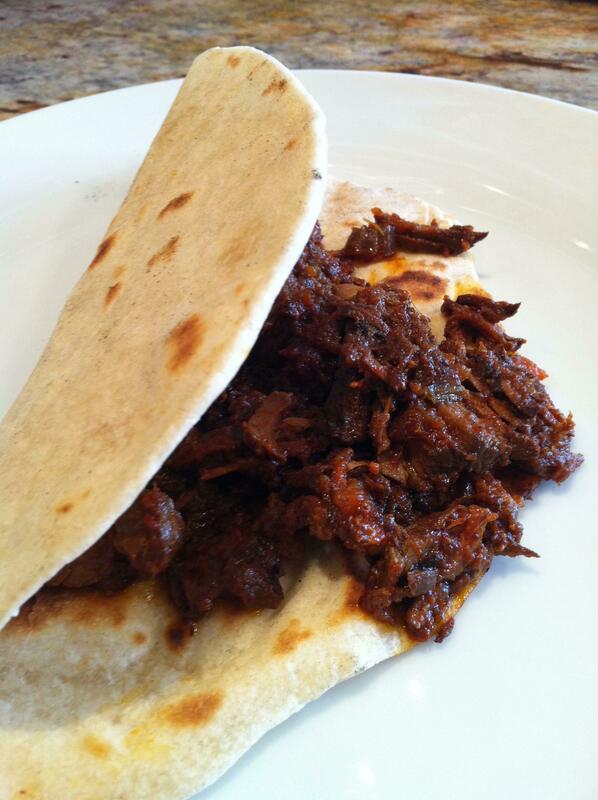 As shown in this Carne con Chile taco, I always fully cook my flour tortillas. And this brings me to the point: “TexMex” cuisine invites debate and contestation. It has been reviled as a bastardized cuisine and also praised for holding together the identity of Texas natives. The label itself is contested since it describes a cuisine that existed even before Texas and Mexico were geopolitical jurisdictions. The cuisine has ancient roots (500 BC) and is fully grounded in this cohesive region, terroir, just North and South of the Rio Grande. Over time the various peoples who came to this region had to cook with what was available and to learn cooking techniques from natives. They had to in order to survive. But they also added from their traditions, perhaps ingredients they had brought with them from wherever they emigrated. I would describe TexMex cuisine as an ancient stalwart tree taking its flavor profile primarily from the land, from all that goes into the “terroir.” As it grows over time, various peoples and cultures graft themselves onto it, defining themselves by it, finding nourishment and strength. It is an evolving cuisine certainly with faulty commercialized spots, but with celebratory tones that define our culture. So in a sense it is natural that TexMex be contested because it represents us, a community in the making. In touch with and exploring our roots but unafraid of changing and adding. All this said, I’ll continue to be riled at not finding a COOKED FLOUR TORTILLA!